Third edition. With this guide you will be able to decode all Chevy small block V8s. From the suffix code stamped on the front deck of the block, you will know the original car the block was installed in, the cubic inches, the horsepower, the transmission, intake and other options. 304 pages. 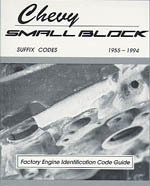 Includes all Chevy small blocks from 1955-1999, and all applications.